In our silly culture we have this idea of ‘conquering’ mountains, nature, and so on. That is total bunk. One can’t ‘conquer’ nature; one can only be spared. In the past few days the BC wilderness has been reminding us of this fact nonstop. How rainy did it get? Well, on Day 2 it was so wet that Maria’s leather saddle transferred its protective coating to Maria’s waterproof pants. 19 mm of rain came down that day. Yeah, that’s right. We were lucky to get a great couchsurf at Nat’s place in Hope for that evening. Nat, who used to work at the Visitor Info Centre, advised against cycling the Kettle Valley trail out of Hope, for two reasons: there might be snow at the 1340m high point, and the trail has not been maintained since winter, so washouts were possible. Therefore, we would take Hwy 3 to Manning Park on Day 3, and continue down to Princeton on Day 4. So on Day 3 we hit our first Big Hill Climb: from Hope (elevation 42m) to Allison Pass (elevation 1342m). Our average speed that day dropped to 10km/h. After the first hill of the day (a 7% grade) we thought we were tired, but then we had to redefine ‘tired’ for ourselves as the day wore on. 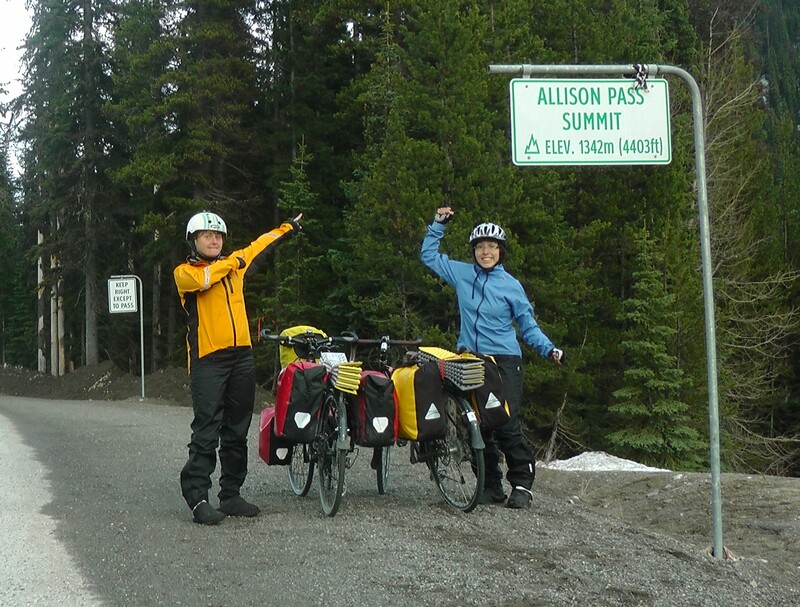 We had a late start — 12:30pm — and only reached the summit of Allison Pass by 7:30pm. At that point we had a little party and got moving because, man, it was getting cold, and sure enough there were snow patches all over. Passing cars started warning us well in advance. First they warned about a bear in the middle of the road, then a bear to the side, and then a long silence — we thought he was gone. But eventually we climbed the hill all the way to the bear. It’s not all bad: that evening, when we finally reached Manning Park Resort, we soaked in the hot tub — a well deserved rest. Nice work guys. I’m glad you were spared by nature. Wishing you some sunny days of riding ahead. Nice meetings you have on road! I like picture with coyote.What does he tell you? Bear, coyote who else did you met?